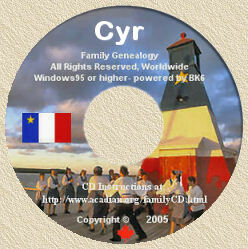 Acadian Genealogy Homepage; Acadian, French & Louisiania Flags! This flag was adopted by the French of Acadia. It simply represents the Tricolor of the French flag and has on the blue bar the yellow star representing "Our Lady of the Assumption", the Virgin Mary. This symbol has special religious significance for the Acadians, since they left France for the New World during a great devotion to Mary. Since its design in 1965 by Thomas J. Arceneaux of Lafayette, La., this official flag has flown proudly throughout the 22 parish area of south Louisiana. To symbolize the French origin of the Acadians is a portion of the arms of their mother country...three fleurs de lis, silver on a blue field. To symbolize Spain, the nation which controlled Louisiana at the time of the Acadian migration to Louisiana and under whom they prospered after years of exile, is the Old Arms of Castille-a gold tower on a red field. The gold star on a white field represents "Our Lady of Assumption", Patroness of the Acadians. The star also symbolizes the active participation of the Acadians in the American Revolution, as soldiers under Galvez. Since 1965, the official Louisiana Acadian Flag has been flown proudly throughout Acadiana  the 22-parish area of south Louisiana populated largely by the descendants of the French-Acadian, or Cajun, people. The early Acadians were exiled from what is now called Nova Scotia for religious and political reasons in the mid-Eighteenth Century. The flag was designed by the late Thomas J. Arceneaux of Lafayette, long-time supporter of English-French bilingual education in Louisiana schools and former Dean of Agriculture at the University of Southwestern Louisiana in Lafayette (1941-73). He was one of the early leaders of the Louisiana French renaissance movement, which has revived interest and pride in the French-Acadian heritage since 1955, the year of the bicentennial of the Acadian exile. He was a charter member of the Council for the Development of French in Louisiana. To symbolize the French origin of the Acadians is a portion of the arms of their mother country-three fleur de lis, silver on a blue field. To symbolize Spain, the nation which controlled Louisiana at the time of the Acadian migration to Louisiana and under whom they prospered after years of exile, is the old arms of Castille-a gold tower on a red field. The gold star on a white field represents Our Lady of the Assumption, Patroness of the Acadians. The star also symbolizes the active participation of the Acadians in the American Revolution, as soldiers under Galvez. Then in 1938, Pope Pius XI solemnly proclaimed Our Lady of the Assumption as the patroness of all Acadians-those in Canada as well as those in Louisiana and elsewhere. Shortly after the arrival of the displaced Acadians in Louisiana, the American colonies started their struggle for independence. At that time Louisiana was a Spanish colony. It is significant to recall the fact that Spain decided to champion the cause of the 13 American colonies in their revolution against the same nation that had so cruelly exiled the Acadians. And so, many Acadians of Louisiana, serving under Galvez, the Governor of Spanish Louisiana, actively participated in the battles of Manchac, Baton Rouge, Mobile and Pensacola-all very important and decisive victories which contributed to the successful conclusion of the American Revolution. Since the Acadians were citizens of Spain at the time of the American Revolution, their star could not appear on the first American flag, Thus, the gold star on the Louisiana Acadian flag serves as a reminder of Louisianas participation in the American Revolution and of the significant contributions of Louisiana Acadians during the struggle for the establishment of our nation. According to history, this flag was adopted during the early days of the French Revolution, to combine white from the traditional flag of the monarchy with red and blue from the arms of Paris. It is thought that the Marquis de Lafayette was responsible for inventing the red, white, and blue cockade which soon became compulsory for revolutionaries in 1789. The flag went out of use with Napoleon's defeat at Waterloo, but was brought back in 1830 and has remained in use ever since. This flag became the official flag of Canada on Feb.15, 1965. The Canadian Parliament debated the flag issue for 33 days. It has an 11-point red maple leaf (Canada's national symbol) in a broad white center stripe, with a broad vertical red stripe at each end. Prior to this flag, Canada used the Red Ensign, which included the British Union Jack, as its national flag. However, in the debate over greater French recognition in Canada, the new flag would not contain any reminders of Canada's ties with Great Britian. This flag was used from 1400 until 1590. The most important flag carried by explorers and settlers was most likely the royal flag, since this was a symbol of authority of the king in the new lands. This flag represented directly the shield in the royal French coat of arms. Fleur-de-lis translates to "Flower of the Lilly".Although it was carried by the explorers, it is doubtful that is was actually ever raised over land. At the time the practice of placing a permanent marker was preferred. This flag and this design with the coat of arms of France in the center are most commonly associated with ceremonial occasions from 1590-1790. There was no specified number of fleurs-de-lis for this flag. Actually this design was printed onto lengths of yardgoods and cutoff to size as needed. The origin of the fleur-de-lis symbol is not known for certain. Some have seen it as a flower, others as weapon, and still others as a frog. The original Banner of France was strewn with fleurs-de-lis. Prior to the French Revolution, there was no national flag which represented France. A variety of flags were used by troops, different types of ships and for other purposes. From 1590-1790 this flag is one of four that was used on warships and fortresses. The plain white flag, known as the Bourbon Banner, and this white flag with three golden fleurs-de-lis, a white flag with many fleurs-de-lis, or a white flag with many fleurs-de-lis with the arms of France in the center. The simpler designs such as this were used in ordinary circumstances and it is believed that the white flag of France flew over all or most of the French forts and settlements in America. The U.S. flag was first adopted in 1777 by the Continental Congress as the national flag representing the original thirteen colonies.They resolved that "the Flag of the united states be 13 stripes alternate red and white, and the Union be 13 stars white in a blue field representing a new constellation". No one knows who designed the original flag, however, claims have been made that Betsy Ross, a Philadelphia seamstress, was the first to make the flags. It has had 27 revisions since then. The current flag became the "offical flag of the United States on July 4, 1960". It continues to have the 13 stipes alternate red and white, and has 50 stars representing all fifty states of the union. Louisiana entered the Union in 1812 becoming the nations 18th state. Its current flag was adopted in 1912. The flag has a blue background and bears a mother pelican feeding and protecting her brood. This design shows the state's role as the protector of its people and resources. The flag also shows the state motto: Union, Justice, and Confidence. The pelican is the adopted stated bird.